Budgets are moral documents—an observation widely attributed to Dr. Martin Luther King Jr. So, what kind of moral statement is Gov. Gavin Newsom’s first proposed budget? The answer is mixed, reflecting both a genuine commitment to inclusive progress—with initiatives on housing and homelessness, expanding healthcare, early childhood education, paid parental leave and more—and the malicious lingering twin legacies of Arnold Schwarzenegger’s fiscal misrule and the Great Recession, both of which severely hobbled the state. 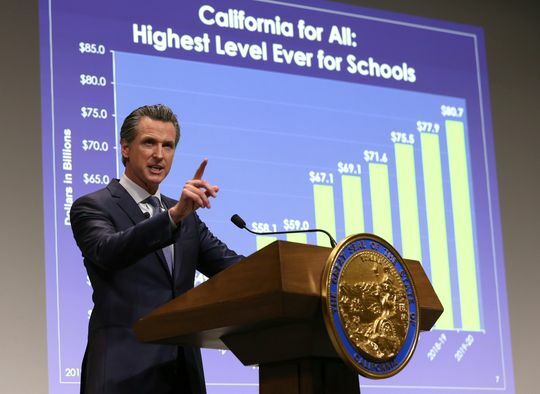 “This budget proposal doubles down on that responsible legacy, finally tearing down the remaining wall of budgetary debt, paying down pension obligations and building up the most robust and prudent budget reserve in state history,” Newsom said. As a result, while Newsom’s budget highlighted several significant progressive initiatives, the money to fulfill them properly is nowhere to be found. Rather, the budget promises carefully crafted ways to get things rolling, which is better than nothing, but far from reaching the goal. Newsom’s budget projects a $21.4 billion surplus—$6.5 billion larger than the Legislative Analyst’s Office November projection—and devotes less than an eighth of that, $3 billion, to expanding ongoing spending. A much larger chunk — $8.5 billion — goes to one-time spending that involves no future financial commitment. But the largest share of all — $10 billion, almost half the surplus — will go to “budget resiliency,” mostly cleaning up the internal borrowing and an accounting trick still left over from the Schwarzennegger years of fiscal denialism, as well as increasing operating reserves and adding an extra $3 billion into the state’s main pension fund. Still, there are some high-profile symbolic advances, and a wealth of solid details, as explained by the California Budget and Policy Center, which works to improve public policies affecting low- and middle-income Californians. The center issued its customary “First Look” report just after the budget’s release, with a webinar discussion on Jan. 17. Its focus was primarily on making sense of what’s there, but they also noted some of what’s missing as well. The U.S. is the only developed nation in the 36-member Organization for Economic Co-operation and Development with no national paid leave. The OECD average of paid family leave (maternal, father-specific and general) was 55.2 weeks in 2016. California became the first US state with paid family leave in 2002, providing most workers with six weeks of partial pay (70 percent for low-income workers, 60 percent for others) to care for a new baby or sick family member. Recently, a handful of blue states have gone further. New York, Massachusetts and Washington will all provide 12 weeks by 2021. Newsom’s six month proposal — a dramatic improvement over anywhere else in America, is still in the lower tier internationally. More specifically, the budget provides $245 million one-time expenditure for child care facilities and a similar amount for child care workforce development, plus a similar $247 million expenditure to improve and expand child care facilities on Cal State University campuses, plus $10 million to develop a plan to increase access to subsidized child care. “Despite this historically large proposed increase, the proposal does not provide more low- and moderate-income families with access to subsidized child care, despite years-long waiting lists,” the center noted. In addition, low-income parents may not be able to make ends meet on family leave. Housing and homelessness are also key concerns. “This is a crisis,” Newsom said in a two-hour press conference. “We’re simply not developing enough housing units.” Indeed, housing costs are a primary reason California leads the nation in poverty rate using the supplemental measure that reflects true costs of living. Newsom’s approach to this is similarly diverse. “The governor’s budget proposes a multi-pronged state-level approach to address California’s housing affordability crisis, including regulatory changes, one-time planning and incentive funding, and an ongoing expansion of tax credits that finance affordable housing development,” the center noted. The budget also includes $500 million in grant funding to address homelessness, part of which is intended for shelters, which Newsom said should be exempted from some environmental review because of the severity of the homelessness crisis. It’s going to take much more than this to address a problem that’s been worsening for decades. But at least it’s a start, an end to simply ignoring it. Creating state health insurance subsidies for Californians with incomes between 250 percent and 600 percent of the poverty line. Creating a state individual mandate to carry health insurance or pay a penalty, replacing the federal mandate repealed by Congress. This would help fund the subsidies and create healthier “risk pools,” thereby keeping premiums lower. Expanding eligibility for comprehensive Medi-Cal coverage to undocumented young adults who are otherwise eligible. An estimated 138,000 undocumented young adults would sign up under this policy, with a cost of $194 million in 2019-20. Finally, the budget calls for a record high of $80.7 billion in funding for K-12 and community colleges, nearly $5,000 more per pupil than seven years ago. However, California was still below the national average this past year, despite one of the highest costs of living. The just concluded UTLA teacher strike reflects that painful reality. The budget also includes a one-time expenditure of $750 million to address barriers to full-day kindergarten, and a $3 billion payment to the CalSTRS pension fund of schools (the employers). There is also $576 million to support expanded special education services in school districts with highly concentrated needs. And it proposes funding for two free years of community college tuition for first-time, full-time students, as well as providing legal services for undocumented students and families. Whatever happens as the budget is revised and developed in the months ahead, significant new goals have been outlined. There’s a lot to be done.